Stunningly beautiful and boldly modern, the heart-cut diamond is an outspoken display of your love for your partner. As a universal symbol of romantic love, the meaning behind this diamond shape is crystal clear, no matter the shape of your love. What is a Heart-Cut Diamond? Made up of between 56 and 58 facets, the heart-cut diamond often features “French tips” on the pointed end that help to magnify shine and brilliance. The heart-cut is considered a modified brilliant-cut shape and is popular for both engagement ring settings and solitaire pendants. Most often, the heart-cut shape is featured in a solitaire setting to accentuate its unique design. The design of each heart-cut diamond should be perfectly symmetrical. The curved halves of the heart should match perfectly. The cleft of the heart, or the V-shaped indentation between the two sides, should be sharp and distinct. The heart diamond cutting process begins with a pear-cut diamond that is then further elaborated into a heart shape by cutting the cleft and rounding out the sides. Since the heart diamond shape requires incredible precision to achieve a proper cut, only the most skilled and experienced diamond cutters tend to successfully produce this shape. Because of their complex shape, heart-cut diamonds of 0.5 carats or larger tend to look best. Smaller sizes may make the unique shape and detail difficult to see and appreciate. How Popular is the Heart-Cut Diamond? The heart diamond shape is one of the rarest and is currently considered the 9th most popular of all diamond shapes. Because of its rarity, the heart-cut tends to surge and decline in popularity quite often. Like with any volatile trend, heart diamond popularity tends to ebb and flow, typically peaking every few years. Often, the heart-cut diamond comes back in style when buyers insist on a more unconventional and uncommon look. In recent years, larger-than-life celebrity personalities like Nicki Minaj, Lady Gaga, and Gwen Stefani have brought the heart diamond shape back into the public eye and increased market demand. What Settings are Ideal for a Heart-Cut Diamond? Bezel Settings: These feature a metal edging that wraps around the rim of the diamond completely. This setting type is secure and will help to protect your heart-cut diamond. However, bezel settings can also block out some light. For this reason, we also recommend including a supplement of diamonds as a halo around the heart-cut diamond to mitigate any loss of light due to this type setting. Three-Prong Settings: This style consists of a claw-shaped binding with three stays that are mounted to the ring. This setting allows more light to reach the heart-cut diamond and, in turn, helps set off your heart diamond’s brilliance and shine. It is extremely important to ensure that your heart diamond is placed properly in this setting to guarantee your stone is as secure as possible. Are Heart-Cut Diamonds a Good Investment? Considering that heart-shaped diamonds are comparatively rare and require a highly-skilled diamond cutter to create, a heart-cut can be more expensive than other fancy diamond shapes. This means that the shape is well worth the additional cost for added quality. What’s more, industry experts consistently predict growth in heart diamond popularity and value— just another reason this diamond cut is a great investment choice. All in all, heart diamonds have a better chance of retaining their value over time versus other shapes, making it a solid investment in your partner. In addition to their rarity, heart-cut diamonds also tend to be more expensive than other shapes because they require a larger carat size to make their full detail as visible as possible. But, don’t let a higher price keep you from getting what you want and what you deserve. If your heart is set on this shape but the price doesn’t align with your budget, the heart-cut shape lends just as well to colorful gemstones like rubies. Gemstone colors also help to round out the heart theme and make a unique piece even more extraordinary. What Should I Look for When Buying a Heart-Cut Diamond? The cutting process of a heart-cut diamond requires impeccable skill and precision. For instance, each of a heart-cut’s 56 or 58 facets requires meticulous planning and execution to craft properly. We mentioned previously that it takes the hands of an experienced and exceptionally talented diamond cutter to achieve an impeccable heart-cut without imperfections. A properly cut heart-shaped diamond should feature two symmetrical halves united in a sharply defined cleft. We generally do not recommend purchasing a heart-cut diamond of fewer than 0.5 carats since its characteristic shape is not as easy to see in smaller stones. On the other hand, heart-cut diamonds over 2.0 carats will show greater detail, but may not appear as brilliant. The two rounded halves of your heart diamond should be perfectly symmetrical. Each side should feature a matching curve that meets in the middle at a well-defined and sharp cleft. A heart-cut diamond silhouette is a matter of personal preference and can come in narrow, fat, or in-between silhouettes. A classic heart-cut diamond has a length-to-width ratio between 0.09 and 1.10. As you prepare to purchase a heart-cut diamond, be sure to look for any signs of a “Bow-Tie Effect”. This is because this effect reduces the brilliant shine of the diamond. The bow-tie is a narrow band of darkness across the middle of the diamond and is considered a blemish since it detracts from the light reflected through the diamond. The trusted professionals at GL Laboratories (GSL) grade all of our Zales diamonds. GSL determines any blemishes within each heart-cut diamond and notes them as clarity concerns. The GSL laboratory grades diamond clarity as one of the following six grades – Flawless, Internally Flawless, Very Very Small Inclusions, Very Small Inclusions, Small Inclusions, or Imperfect. Evaluating a heart-cut diamond for purchase is an entirely subjective process. Because many small inclusions or blemishes can only be seen by a professional with specific equipment, small inclusions are often not noticeable to the human eye and may not be a concern for your purchase. Other buyers may prefer knowing that their diamond is free of blemishes, and may choose to pay more for a higher-grade clarity. This choice is entirely a matter of your personal preference and unique taste. An industry-wide diamond color grading system is used for all diamonds. The system begins with a D grade (colorless) and continues alphabetically with increasing levels of color up to a Z grade. The GSL laboratory uses master stones that have been tested with pre-determined color grades to determine the color grade of each heart-cut diamond. The size of the diamond has a large influence on the perceived color of the diamond when viewed by the human eye. Small differences in the color of each heart-cut diamond may not be noticeable to the naked eye but may account for a large jump in the price of the diamond. With heart-cut diamonds, we recommend visually examining each stone before purchase to ensure you are completely happy with the color. With all diamond jewelry, the material and color that will be used for the diamond setting can noticeably affect your heart diamond’s color. For this reason, we strongly recommend that you keep your desired setting in mind when shopping for a heart diamond. A diamond’s length-to-width ratio is determined by the GSL laboratory by dividing the length of the diamond by its width. The resulting ratio determines how proportionate the heart-cut diamond is to its intended shape. Personal preference will dictate how narrow or stout your perfect heart-cut diamond is. A traditional heart-cut diamond generally has between a 0.90 and 1.10 length-to-width ratio and features symmetrical arches of even height and width. 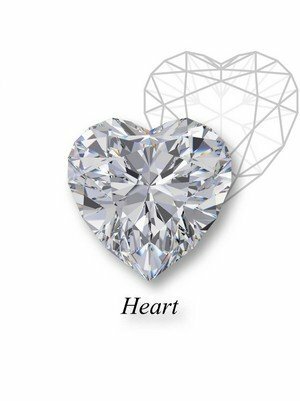 When shopping for heart-cut diamonds, we recommend comparing a variety of heart-cut diamonds to determine your preferred length-to-width ratio. Though the exact origins of the first heart-cut diamond are unknown, the first recorded version of this shape was featured in a 17th-century portrait called “The Gonzaga Princess” by Frans Pourbus the Younger. Painted in 1605, the portrait shows the princess’s left sleeve adorned with a variety of diamond cuts. Some of the many shapes appear to resemble an early variation of the heart-cut. Later, in 1655, the heart-cut diamond was mentioned in a book written by Jean-Baptiste Tavernier, a merchant-traveler who found his fortune trading precious stones. In the book, he recounts seeing a 26-carat “Heart Diamond” in India. Over the years since, heart-cut diamonds have been modernized and have appeared in a variety of royal and world-famous jewelry. With advancements in diamond-cutting technology and the more widespread use of lasers, diamond cutters have more easily achieved perfectly cut heart-shaped diamonds without sacrificing brilliance. With a rich, royal and romantic history rooted in the 17th-century, the heart-cut diamond shape can truly be called an outspoken declaration of your love. A rare diamond shape that requires extreme skill and precision to cut properly, the heart-cut shape is perfect for engagement and wedding bands to announce your love to the world. Since heart diamonds are among the rarest and most difficult shapes to cut, they tend to be more expensive than other fancy shapes. Get the best of both worlds with the more affordable gemstone heart option. If the iconic shape of a heart-cut diamond speaks to your style, find your ideal Zales heart diamond now.